Build your own cabin, cottage, or small home! Our Plans & Tools can help. In early 2019 we will be adjusting our Plan prices, so if you'd like to take advantage of the current prices (which haven't changed in over 10 years) please place your Order soon. Happy Building! Have fun builidng your house! 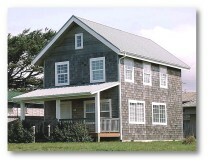 We sell expandable and modifiable small house plans for those who want to build their own small home, cottage or cabin. You can modify our standard plans to fit your site, budget and building style. Click Plans and home design tools to get your home building project moving. Go to the free forum to see how members help each other out. Site Reading Tip: "Ctrl +" to enlarge text, "Ctrl -" to shrink. • Click the Gallery in the orange link bar above to see houses others have built using our plans. • These FREE Tools will help you find and evaluate property. • How to customize a stock plan - for example, one of our plans on the LEFT. See the RIGHT side for FREE FORUM links. Most Popular Houses: The photo links at the left have stories about homes members are building using our plans. At the far left column are links to our stock plans that provide full construction blueprints for simple-to-build houses. Gallery pages show more owner-projects. 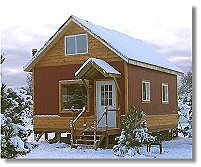 Resources for New Builders: This site has a great deal of information on building a small home, cabin or cottage. Just mouse around this master portal page to links that interest you. The Tiny House (200 sf) Design Contest has spurred many ideas! Click Books for helpful reviews of design & building books. Join the Small Home Discussion: Visit our free Forum. Use it to get answers to questions about home planning and building (using our plans, your own, or anyone else's). We now have over 10,500 members with more than 189,000 Q&A posts. Try the Owner-builder section for a first visit. When you sign up, you are welcome to start a new thread with info and photos of your own evolving project. Joining and posting is free, click here for Mountain Don's helpful tutorials. Finally... don't know if you could really build a small house or cabin? Get Inspired! 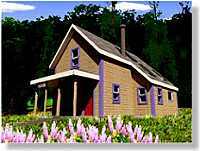 Customizing a Stock Plan — How to get the house you you want from an inexpensive standard house plan. What it cost to build — Use this simple construction cost estimator, or see The Right Amount to Spend on a New House. 21st Century Foundations — New materials for basements and crawlspaces. Post and Pier Foundations — An alternarive for sheds and small buildings. If you have good soil. Building for Tornados — Details to consider when building in high wind areas. Thought Experiments — How to build a house in your mind. 5 ways to build your house — Different ways to balance your money, time and skills. Design Contest — Winners of the under 200 sf house design contest. How small can you go? Small Alternative House — A photo tour of a 3 building post & pier compound under 1000 sf. What fuel to heat with? Want to visit the competition?